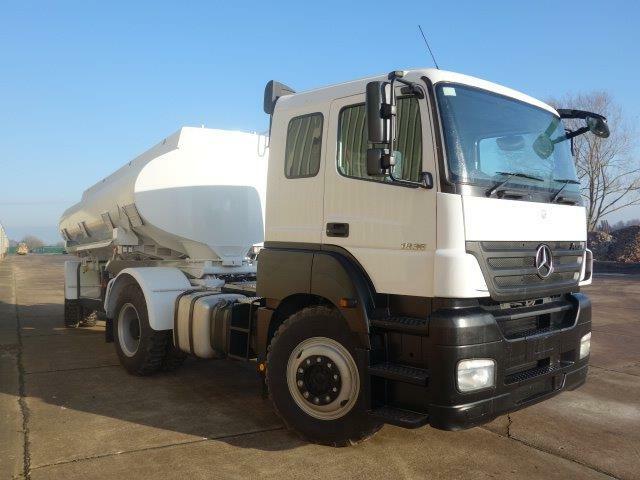 The unit comprises of a Mercedes 4x2 tractor unit coupled with a fixed turn table ex.military thompson 20,000 litre 4 compartment alloy tank on a multidrive chassis with rear steering bogie. The tank is operated by a PTO pump from tractor with bottom loading and is fitted with avery hardoll fuel flow meter. This truck is one that we have converted using the Thompson tri axle 20,000 litre tanker trailer unit and coupled to the Mercedes Axor, this job has lasted for around 10 months.